Pakistani President Pervez Musharraf has ordered firm action to crack down on unrest following the death of opposition leader Benazir Bhutto. Mr Musharraf said looters "must be dealt with firmly and all measures be taken to ensure [the] safety and security of the people". Some 38 people have died in violence that has broken out since Ms Bhutto was assassinated on Thursday. Meanwhile, her party has rejected the government's explanation of her death. A government spokesman said her head was slammed against her vehicle by the force of a bomb - but colleagues said she died from bullet wounds. 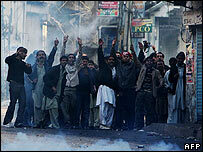 Troops have been deployed onto the streets to try to quell the violence that has broken out since Ms Bhutto's death. The shells of burned cars littered the deserted streets of Ms Bhutto's home city of Larkana on Saturday, after overnight rioting. 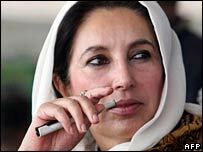 Nine election offices in Ms Bhutto's home province of Sindh were also reportedly burned to the ground. Pakistan's election commission called an emergency meeting on Monday to discuss the impact on parliamentary elections due on 8 January. Interim Information Minister Nisar Memon told the BBC that "we remain on course for the democratic transition", but that a decision on whether polls should be postponed would be made in consultation with all the political parties. The government, meanwhile, stood by its account of Ms Bhutto's death. Interior ministry spokesman Javed Iqbal Cheema said on Friday that she was killed when the force of the bomb blast knocked her head against a fitting on her vehicle. A surgeon who treated her, Dr Mussadiq Khan, said earlier she may have died from a shrapnel wound, while her aides insisted she was killed by two bullets, one of which pierced her head. A spokeswoman for her Pakistan People's Party accused the government of trying to minimise its responsibility for Ms Bhutto's safety, and said the official account was "dangerous nonsense". But Brigadier Cheema said: "We gave you absolute facts... corroborated by the doctors' report." He said Ms Bhutto's family was free to exhume her body for a post mortem if it saw fit. Ms Bhutto was buried on Friday at her family's marble mausoleum. Brig Cheema also said Pakistan did not need the help of the international community in investigating the assassination. And he again accused a Pakistani militant, Baitullah Mehsud, of ordering the killing. The tribal leader from South Waziristan, who has close links to al-Qaeda, has denied the accusations through a spokesman. But Brig Cheema said: "We have the evidence that he is involved. Why should he accept that he has done it? It does not suit him. I don't think anybody has the capability to carry out such suicide attacks except for those people."